Tailor-made SPD review work for results that count. Permanently. In a climate in which every UK Authority is required to save money and cut costs, it is essential that every effort is made to maximise all Revenues streams. A perfect example of this can be found with the identification and cancellation of fraudulent or inappropriate applications for Council Tax Single Person Discount (SPD). Currently, a Single Person Occupier is eligible for a 25% discount on their Council Tax liability; this discount is awarded on receipt of a signed application form that includes a declaration that they are the only person living at the relevant address. Reviews should be regularly undertaken throughout the year in an attempt to prevent fraudulent or inappropriate applications from receiving this discount. A recent report by the Audit Commission, ‘Audit Commission – Protecting the Public Purse Sept 2009’, claimed that many councils have noticed a sharp increase in the number of people claiming SPD and have identified increasing numbers of fraudulent applications. At the time of writing the report highlighted the fact that eleven Authorities had been involved with proactive measures to identify SPD fraud and suggested that it would be good practice for other Authorities to undertake similar work. In those councils examined, the level of confirmed SPD fraud varied between 1 per cent and 11 per cent, with most clustered between 4 and 6 per cent of SPD claims. Assuming an estimate from this limited sample of SPD fraud levels of 4 per cent nationally, undetected SPD fraud could be costing honest taxpayers £90 million each year. The report pointed out that Single Person Discount Fraud is responsible for Council Tax charges being higher than they would otherwise need to be. The most significant text in the report is the paragraph which talks about ‘disproportionate financial incentives’ where the costs of council tax collection and fraud investigation is borne by the District Council, but the County Council generally receives a larger share of the council tax collected. This issue needs to be considered by all two-tier (County) areas, argues the report and a solution found. Branch & Lee Consulting Ltd believe that in such circumstances, the County Council and Police Precepting Authorities should contribute to any additional exercise that will help detect and reduce Single Person Discount fraud. By sharing the costs, in proportion to the amount of precept received, the District Council has a far greater incentive to conduct the review whilst the County Council will be the biggest beneficiary. Single Person Discount reviews are growing in popularity as a means for any Authority to maximise the amount of Council Tax that it receives. However, amid this interest is the increasing concern that some of these external bodies that provide this service are undertaking these reviews at great costs to the Authority and are providing a two dimensional service. The Branch & Lee Single Person Discount review will be tailored to suit the needs and budget of any Authority. We provide a bespoke service designed to maximise Council Tax revenue whilst helping to protect the Authority against further fraudulent claims. It has been argued that due to the nature of payment that some external consultants or agencies require (a fixed price for every SPD cancelled, often as high as £50.00) they often use a blanket approach to cancel as many SPD’s as possible. Whilst this is the ultimate goal of the review, what this fails to reflect is the likelihood that a number of these cancelled applications will re-apply soon after being cancelled (and subsequently the discount re-awarded) because they simply failed to return the application form within a given timescale. Branch & Lee Consulting Ltd will only cancel claims where the evidence shows that it is highly likely that another person over 18 years old resides in the property. As our fees are not based on the total number of cancellations generated it is not in our or the authorities interest to cancel SPD’s only for the customer to re-apply or appeal against the decision. It is essential to achieve long term financial returns as opposed to a quick but temporary income. In short, Branch & Lee Consulting Ltd offer a more holistic approach whilst significantly cutting costs to the Authority; we do not charge per claim cancelled and this is why we are significantly cheaper than other SPD review suppliers. Every Authority has a large number of customers in receipt of Single Person Discount. On an annual basis (rolling review), the validity of these claims are often checked by way of a postal review. Failure to return this review form once completed or where single occupancy is no longer applicable, the Single Person deduction is removed. The rolling review of SPD claims, although a sound idea, relies heavily on the customer’s ability to be honest! These reviews result in around 80% of customers declaring no changes. This in effect makes 75% to 80% of review forms unnecessary. The best, and most reliable, way to conduct the SPD review is to use alternative information sources that are available outside the usual remit of the Council, i.e. a Credit Reference Agency. In this case Branch & Lee use the services of Equifax, arguably one of the biggest Credit Reference Agencies in the world. Based on exercises conducted at other local authorities, the initial comparison between Council Tax records and information held by the Credit Reference Agency flags up a discrepancy of between 15-20%. Prior checks with the CRA will show a substantial financial saving in postal and printing costs. These cost savings can be offset to fund the SPD review which, when completed, will attract a significant amount of extra income for the Authority. Many Local Authorities are now realising that removing invalid SPD claims significantly increases the amount of council tax collected. This money can be ploughed back in to local services to the benefit of the community as a whole and will help to keep council tax chargers down in future years as well as protecting jobs in Local Government. The cost of the SPD project will depend on the tailored needs of your Authority, but we do not charge per claim cancelled. We think that this is a false economy. No matter how one looks at the Branch & Lee Single Person Discount review, it is clear to see that the Authority stands to make significant gains. It is a particularly prudent exercise to undertake with Branch & Lee, as we are considerably cheaper and offer a more bespoke service than other consultants or agencies. We guarantee that in order to make this a no risk service, the additional income generated by this project will be at least four times the cost. If not we will adjust our costs accordingly. However, should the income generated by this project be even greater than four times the cost, we will expect no additional monies. Other provider’s charges escalate in line with the number of cancellations; our costs do not change. Branch & Lee are rolling this service out to Local Government across the UK. 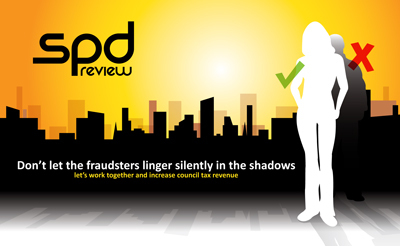 It is by far the most effective and efficient way of handling the Single Person Discount annual review that virtually every Authority undertakes anyway AND it is designed to significantly increase the Authority’s Council Tax revenue. Besides, not to have such a review is tantamount to throwing money away. It’s your money and you are entitled. © 2010 Branch and Lee. All Rights Reserved.